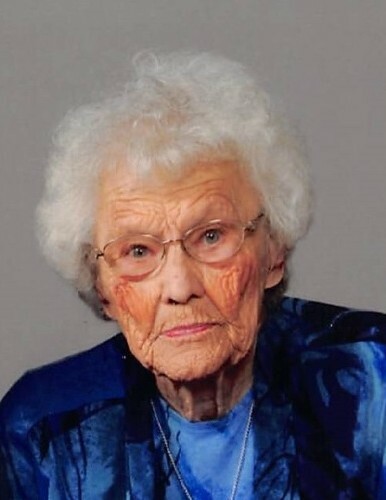 Alice M. Schmeidler, age 92, of Hays, Kansas passed away Wednesday, April 10, 2019 at Via Christi Village, Hays. She was born November 24, 1926 on the family farm in Rush County, Kansas to Carl and Lidwina (Zimmerman) Unrein. On August 23, 1975 she married Cyril J. Schmeidler in Victoria, Kansas. Alice was a homemaker and enjoyed cooking and baking for her family. She also enjoyed gardening, canning, and sewing. She was a member of St. Catherine Church and the St. Catherine Christian Mothers. She is survived by her husband, Cyril of Hays; 4 sons, Neal (Lorrinda) Schmeidler of Springfield, Virginia, Phil (Brenda) Schmeidler of Hays, Michael (Cheryl) Schmeidler of Hays, and Lloyd (Brenda) Schmeidler of Durham, North Carolina; a brother, Tim (Connie) Unrein of Ocala, Florida; 2 sisters, Sr. Eleanor Unrein and Sr. Charlotte Unrein both of the Great Bend Motherhouse of the Dominican Sisters of Peace in Great Bend, Kansas; 12 grandchildren, Lori, LaNette, Lance, LeAnna, Scott, Kent, Jarett, Nolan, Jennifer, Clayton, Julie, and Stephanie; as well as 29 great grandchildren and 1 great-great grandchild. She was preceded in death by her parents; four brothers Vernie, Charles, George and Lyle Unrein; two sisters infant Marie Unrein and Ann Rohn; and, also two great grandchildren. Funeral services will be 10 AM Saturday April 13, 2019 at St. Catherine Catholic Church in Catharine, Kansas with burial to follow in the church cemetery. Visitation will be Friday 4 PM – 8 PM at Brock’s-Keithley Funeral Chapel and Crematory 2509 Vine Hays, KS 67601. Saturday visitation will be at the church 9 AM until service time. A parish vigil service will be Friday at 6:30 PM followed by a St. Catherine Christian Mothers Rosary service all at the funeral chapel. Memorial contributions are suggested to St. Catherine Church, Dominican Sisters of Peace Great Bend, or to TMP-Marian.